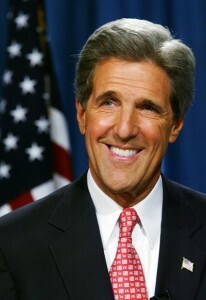 There’s no question John Kerry is more likely than George Bush to do something –anything!–about global warming. But conservatives are noting how little his platform mentions the issue. A phrase conspicuously absent from the Democratic platform drafted for this week’s convention is “global warming.” Nor does the document specifically call for the U.S. to ratify the Kyoto Protocol or adhere to its proposed emission reductions. “We must dramatically reduce climate-disrupting and health-threatening pollution in this country, while making sure that all nations of the world participate in this effort. Environmental standards should be raised throughout the world in order to preserve the Earth and to prevent a destructive race to the bottom wherein countries compete for production and jobs based on who can do the least to protect the environment. There will be no new bureaucracies, no new agencies, no new organizations. But there will be action and there will be progress. The Earth truly is in the balance – and we are the guardians of that harmony. “Unaccountably, the only Democratic group left out in the cold … is the tree-hugging set. Can you imagine a Democratic platform document without a single mention of global warming? “Because of the cutbacks and the cavalier attitude of the Bush administration, in general there is a much greater awareness of how important environmental issues are. This is an issue not just for Democrats but it is also important to independents and Republicans who care about the environment. True, the 2004 Democratic platform doesn’t expressly mention “global warming” or “Kyoto.” But the document is far shorter than its predecessor, and much of it, naturally enough, is given over to war and terrorism (got a problem with that, conservatives?). But despite the short length of its environmental section and its sometimes tentative language, the platform does say “climate change is a major international challenge that requires global leadership from the United States, not abdication.” It also advocates a number of clearly anti-Bush stances like cleaner air and water, restoring a “polluter pays” approach and protecting public lands from commercial interests. Conservatives might hope the platform’s relative lack of focus on the environment damages the Democrats’ credibility with greens. But considering the alternative, such voters have nothing to gain by leaving Kerry’s camp.